I submitted my book, Breaking Big Money’s Grip on America, to independent reviewers to seek recognition that would help me market my book. Below are a few examples of the success I’ve had doing this. I regularly use these reviews to promote my book. They have helped me secure radio interviews and readings at bookstores and civic organizations. On January 17th of this year, the Albuquerque Journal named my book its “Book of the Week” and called it a Game Changer (see https://revivingdemocracy.files. wordpress.com/2016/03/abqj-gamechanger2.pdf). Then in February, Midwest Book Review noted Breaking Big Money’s Grip on America was “a must read” and gave it its highest recommendation (see http://www. midwestbookreview.com/sbw/feb_16.htm #PoliticalScience). And, in March, Foreword Reviews made the book a finalist for its Independent Book of the Year Awards in the political science category (see https://indiefab.forewordreviews.com/books/breaking-big-moneys-grip-on-america). Reviews help secure radio interviews and readings at bookstores and civic organizations. Breaking Big Money’s Grip on America is an urgent call to all Americans to focus their attention on a critical issue: The power huge sums of money has to unduly influence U.S. elections and public policy. Some people see the United States as a plutocracy run by and for the very rich. This book provides convincing evidence to support this view and explores how a nonpartisan Democracy Movement can overcome the ruling status of Big Money and convert our government into one that instead serves the true needs and desires of the American people. Moreover, the book demonstrates why breaking Big Money’s grip on our government is critical to solving other crucial issues like affordable healthcare, climate change, gun violence, homeland security, immigration reform, Social Security, and income inequality. Whether you are Left, Right or Center, Breaking Big Money’s Grip on America demonstrates that your participation is needed to build a grassroots movement to fix our broken political system and revive democracy in America. Build a grassroots movement to fix our broken political system and revive democracy in America. 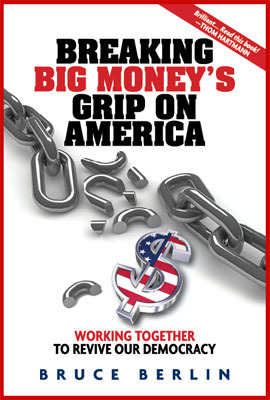 For more information about this timely and important book, go to http://www.breakingbigmoneysgrip.com. You can reach author Bruce Berlin via email at breakingbigmoneysgrip@gmail.com.